東山ファーム ～早川谷極上米～: お試しパック 玄米版 登場！(#^.^#)　Taste pack of brown rice version appears! お試しパック 玄米版 登場！(#^.^#)　Taste pack of brown rice version appears! Thanks to you, we have ordered the tasting pack from urban people. And this time, we prepared a new pack for brown rice version tasting pack! As well as a milled version, pack of 3 (450 g). It is 900 yen including tax and shipping fee. ※ Click here for purchase! Recently, the movement to incorporate macrobiotech into life is spreading around the world, and feeling that customers who request brown rice are increasing more than expected are feeling. 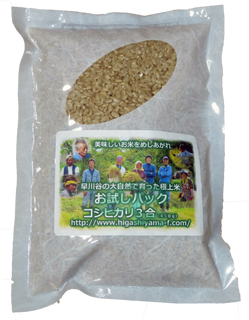 Please try the rice brought up by the wonderful nature upstream of the Hayakawa Valley even with brown rice!